I really enjoy learning about tarot. For those who associate tarot with boardwalk gypsies or sketchy advertisements, there is so much more to it. Tarot has been practiced for centuries and studied by some of the greatest minds in history (Carl Jung for example). Every once in awhile, I like to give myself a reading. It's a nice way to examine my thoughts and feelings about the way things are going in my life. At the very least, it's fun to read into the symbolism and story behind each card. I wish more people had an open mind about things like tarot. Whether they laugh at me or ask 100 questions following their reading, tarot is one of my favorite things to do for other people. 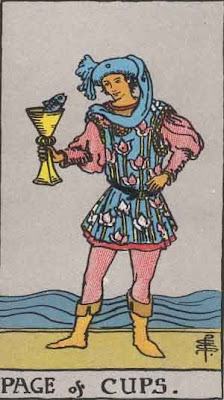 The Page of Cups, like the Pages in all the suits, represents some sort of beginning or renewal. The young man stands alone at the seashore with a single golden goblet in his hand. Surprisingly, a fish pops its head out of the cup and the young man's face. The young man simply expects to raise his cup for a toast or a drink, and instead is confronted with the ominous appearance of a fish which even appears to be speaking to him. Thus, inspiration is seen to be something which comes upon us most unexpected. The Page of Cups is a fellow, who is somewhat effeminate in appearance. He is dressed in a blue tunic with floral print all over it and sports a bohemian type of beret on his head with a long, flowing scarf attached to it. He holds in his right hand a golden chalice with a fish peering out of it. He also wears a pair of boots, while standing in the sand with a body of water, that appears to be a flowing, like a wavy sea in the background. The Page of Cups signifies the beginning of creativity or the start of a new project or creative venture. It may also signify the beginning of a new relationship or the dawning of a new perspective on a difficult situation. The fish, in Christian terms, represents Christ or Christ consciousness. In other mythological systems the fish often represents the unconscious, the spirit, or the life force within us. The Page of Cups indicates the surprising and unexpected nature of inspiration that comes to us from the realm of the unconscious and the spirit. Inspiration is seen to be something which comes upon us most unexpectedly and often in a manner which we do not understand. If you encounter the Page of Cups in a spread, it is an indication that there is creative energy trying to burst forth into your consciousness. The unconscious is trying to speak to you, possibly through your dreams or through synchronistic encounters with significant people. The message to be taken is that you must be open to the unexpected, occasionally bizarre impulses of the creative spirit and not shut out inspiration simply because it does not fit in with a rational point of view. This Tarot card signifies the beginning of creativity or the start of a new project or creative venture. It may also signify the beginning of a new relationship or the dawning of a new perspective on a difficult situation. The Page of Cups meaning can indicate dreams coming true particularly in relation to love and relationships. It promises hope and opening of your heart to receive true love. When this Tarot card appears relating to spiritual issues it can indicate the beginning of a spiritual journey undertaken for emotional reasons. The Page of Cups in a Tarot Reading can also foretell news of a birth, a wonderful idea or plan, or a message of emotions involving new or renewed love. If this Tarot card is prominent in a Tarot Spread it can predict that you may come into contact with, or already recognise in your life, a gentle, romantic individual with a high degree of sensitivity and compassion. He is caring, warm and responsive and very in touch with his emotions and is likely to be highly creative and artistic. I really enjoyed this article and the way you explained the meaning and significance of the page of cups. I'll share this on my FB page so that my followers can read it too - there's so much wonderful information here. Thanks for sharing.